During pregnancy, it’s normal for the tissue between the two sides of the muscle, called the linea alba, to thin out so that your muscles can spread to make way for baby. 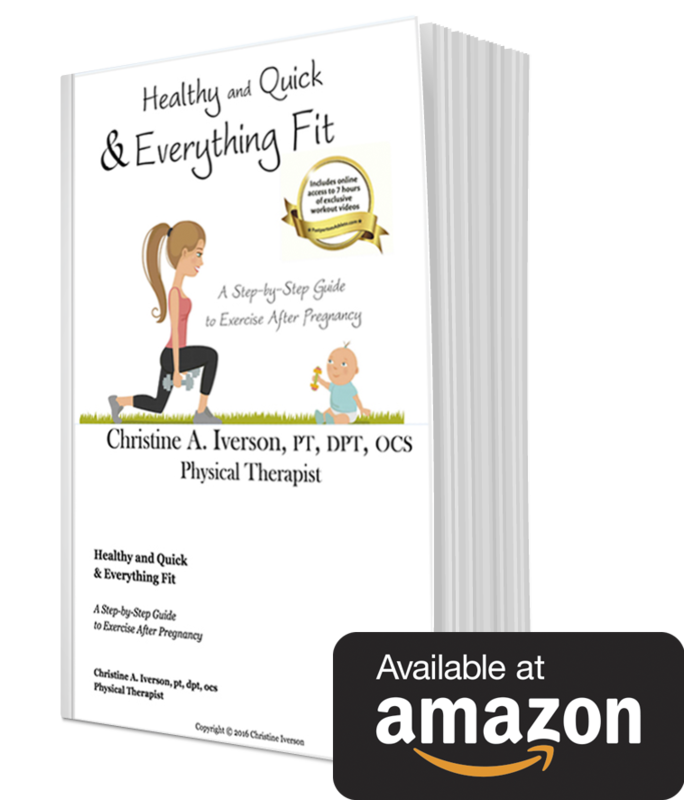 For most women, that will resolve on its own either immediately after giving birth or a little more gradually over the first 8 weeks postpartum. For others, that’s not the case, and these moms need help to fix the problem. 1. Lie on your back with your knees bent, like you’re going to do a crunch. 2. Place 3 fingers at the level of your belly button so they’re lined up together in the middle, widthwise across your belly. 3. Use your abdominal muscles to do a mini crunch – just enough to lift your head off the ground. 4. As soon as you feel the abdominal muscles on either side of your fingers start moving, stop the crunch there. 5. You can measure the distance between the muscles with your fingers. If you can fit 2 fingers or more in the gap between the muscles (2cm), you have a diastasis recti that needs the attention of a physical therapist. A 1-2cm gap is considered normal. With that said, you may have a functional problem with a gap that’s smaller than 2 cm. If you’re still noticing that when you do certain exercises or movements like planks, push ups, or crunches, your belly bulges down the center (a visual clue that there’s a diastasis recti), that’s likely a problematic diastasis recti. If you have a diastasis recti problem 8 weeks or more postpartum, you’ll need some help to fix it. The best course of action is to have a physical therapist who specializes in women’s health and diastasis recti examine you and prescribe an exercise program that is individually tailored to your body and the way you move. If you can’t find one near you here, don’t worry, the lists are not all-inclusive. Make a phone call to your nearest physical therapy clinic and ask – rehab is a small world, and they’ll be able to direct you to someone who can help. Important Note: If you have a diastasis recti >2cm, do not do any of the crunches, planks, negative sit-ups, double leg curls, or double leg lowering in this program unless your physical therapist tells you it’s okay. Instead, do another round of your core drill and keep the video rolling. Diastasis recti is actually a hot topic of debate in rehab circles. 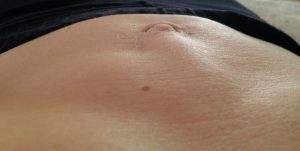 There is a lot of conflicting information available (often from reputable-sounding sources and videos) about exercises that help or hinder a diastasis recti problem to heal. Some sources say to do crunches, and others say crunches will make it worse. Some sources say to do planks, and others say planks will make it worse. Some say to wear an abdominal brace, and others (me included, for most situations) say the brace can make it worse. There are off-the-shelf programs designed to help women with diastasis recti, and if going to see a physical therapist for an individual treatment program just isn’t an option, choosing a program focused on transversus abdominis strengthening is a better option than choosing one focused solely on the rectus abdominis. One program out there (that I have not personally tried, and who I am not affiliated with in any way) that puts a healthy amount of focus on posture, function, and transversus abdominis strengthening, is the MuTu System. 1. Stop doing things that make it worse. One of the main culprits in diastasis recti is posture. While pregnant, many women will glide their torsos back behind their hips to account for the extra weight. After pregnancy, this is actually even more common because that’s the typical posture we use to carry our babies, and as they continue to get heavier, we continue to lean farther back. Leaning back in that way puts stress on your healing abdominal muscles and increases your abdominal pressure, which pushes against the thin linea alba, preventing the healing process and aggravating the problem. Altering your functional movements to avoid stressing your rectus abdominis without adequate support from your transversus abdominis can be very tricky, but it is very important to your recovery. Therapeutic exercises done once or even a few times a day won’t hold a candle to your many functional movements throughout the day. Your program should include functional modifications, such as consciously pre-setting your transversus abdominis before moving something heavy, using a baby carrier instead of leaning your torso back while carrying baby, and proper body mechanics while lifting. Other things that make a diastasis recti worse are plain old (without modification provided by a physical therapist) crunches, planks, oblique crunches, heavy diagonal lifts, and pull ups. Also, if you notice the midline bulge with any of your exercises, stop that exercise and substitute with something that doesn’t put so much pressure on the healing tissue. 2. Re-train your core muscles as a team, with focus on your transversus abdominis. Your transversus abdominis is the deepest layer of your abdominal musculature. Strengthening your transversus abdominis is important for core functioning and for healing a diastasis recti. When you strengthen your transversus abdominis, you’re strengthening an internal corset underneath the rectus abdominis. This is critically important for bringing the separated muscles together on the underside, allowing the healing process to take place and preventing the abdominal pressure from pushing through during day-to-day activities, which makes the separation worse. Your program should focus on transversus abdominis strengthening and timing as the cornerstone of the process. You’ll also need to train your core as a whole, including your diaphragm, pelvic floor, transversus abdominis, deep back muscles, and outer back and abdominal muscles. Since activating your transversus abdominis correctly is tricky, especially after pregnancy, it is very helpful to have a medical care provider give you feedback either manually or, even better, using diagnostic ultrasound to visualize the muscles. With training programs like this one, more and more physical therapists and medical care providers are able to use diagnostic ultrasound to help women activate and strengthen the correct muscles as they recover. 3. Address the rectus abdominis in an individualized way, and only when the transversus abdominis is strong and functional enough. Re-training the rectus abdominis is important for getting the tissue between the muscles to heal together. Strengthening the rectus abdominis too soon, too strenuously, or too frequently can cause your diastasis recti to worsen. When a diastasis recti is present, rectus abdominis problems can vary widely. For some women, the rectus abdominis is too weak, for others it’s too tight, and for still others it is riddled with trigger points, or tender knots. Since this is such a tricky part of the puzzle, it is best done with hands-on care. Often, when the rectus abdominis is addressed, the treatment may start with barely activating the muscle with manual pressure to hold the two sides of the muscle together. For other women, addressing trigger points or tightness first is paramount. On rare and severe occasions, a brace is used under specific guidance from a medical professional to hold the tissue together to allow for early healing. If a brace is used when it isn’t needed, it can do more harm than good. My favorite online resources for up-to-date information about this condition, are Diane Lee’s website and Julie Wiebe’s website. Both are renowned physical therapists who have done extensive work in this field and consistently post about up-to-date research on the topic. 1. Benjamin DR, van de Water ATM, Peiris CL. Effects of exercise on diastasis of the rectus abdominis muscle in the antenatal and postnatal periods: a systematic review. Physiotherapy. 2014;100(1):1-8. 2. Opala-Berdzik A, Dąbrowski S. Physiotherapy in diastasis of the rectus muscles of abdomen in women during pregnancy and postpartum. Physiotherapy. 17(4). 3. Mesquita LA, Machado AV, Andrade AV. Fisioterapia para redução da diástase dos músculos retos abdominais no pós-parto. The Revista Brasileira de Ginecologia e Obstetrícia. 1999;21(5):267-272.